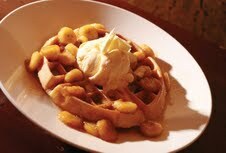 Perfectly layered flavors of waffle, caramelized bananas, vanilla ice cream and whipped cream. Decadent deliciousness. I don't know how they do it, but the awesome vape flavor masters (I call them my 'flavor angels' *smile* ) at Altcig put two of my favorites, waffles and bananas foster, into one geat vape. Tastes just as yummylicious as the name implies and like a fine wine, it just gets better with age (aka steeping, although definitely not required!). If you want a great dessert vape, look no further. It's a great combo. Needless to say this, like all the others I've tried, are all so good it's hard to narrow down to just a few choices because you really can't go wrong no matter what you decide on :) Further, if you've been afraid if banana flavors before because they are too 'fake' or candy-like try one of Altcig's banana vapes, you won't be sorry. Nice warm banana and vanilla flavor in this one... I'm really enjoying it and plan on ordering more! My only regret is that I didn't order a bigger size. lol Not disappointed in the least! This is BY FAR my favorite flavor from Altcig! The banana flavor is very rich and creamy, and AWESOME vapor production as well. This is definitely a WINNER! The BEST Bananas Foster PERIOD! So I saw this on the AltCig Menu and I bought a 70 ml. bottle to try it out! I just recieved it 5 min. ago and filled my bliSS Gen. Atty and ALL I can say is...WOW! The BEST Bananas Foster I have ever tried! The Flavor just bursts in your mouth with OUTSTANDING Vapor Production and just the right Throat Hit! Just FREAKING OUTSTANDING! I RECOMMEND this to EVERYONE! This is just another FLAVOR that AltCig has out done themselves with and I will DEFINITELY be putting in ANOTHER order! Thank You AltCig for another OUTSTANDING Flavor!